Comfort loved ones with one of our Sympathy Gift Baskets filled with gourmet food and delicious snacks. Thoughtfully tailored sympathy gifts with your personalized gift message. included with all of our Sympathy Gift Baskets and Condolence Gift Baskets. With Our Sincere Condolences Gift BasketEncourage a loved one who’s suffered a loss when you send this graceful, gift basket made of fine, hand-woven gold willow that says you’re thinking of them. The thoughtful card is sure to let them know they are in your thoughts during this difficult time. In Loving Memory Sympathy Gift BasketRemember a loved one and comfort those who care when you send this sympathy basket filled with well wishes. With Our Deepest Sympathy Gourmet Gift BoardSend this caring expression of your deepest sympathy and and you'll make a difference in their day. This solid wood cutting boards is tied with a sympathy ribbon and filled with an array of tasty gourmet cheese, sausages, nuts and more. Your thoughtfulness will be remembered. Deeper Than Tears Sympathy Gift BasketA gentle word. A kind gesture. During a time of grief and loss, it's the simple things that truly mean the most. Send your sincere condolences with a woven basket filled with endearing tokens of your thoughtfulness. Time To Grieve Condolence Gift BasketDuring this difficult time of loss, let them know they are remembered by you. This elegant gourmet gift basket is filled with small gourmet items to nibble when the time is right and a thoughtful inspirations sympathy book. Sending Our Prayers Sympathy Gift BasketSend caring condolences and words of comfort with this beautiful gourmet food basket filled with creamy Italian cheese dip, bavarian style pretzels, Ghirardelli chocolates and more. Our Sincere Condolences Gift ChestA time of sorrow requires a supportive expression of comfort. Our Sincere Condolences gift chest will help ease their sorrow during this difficult time. This elegant gift includes an embossed antique finish metal gift chest and includes a Never Give In book of inspirational quotations and thoughts. 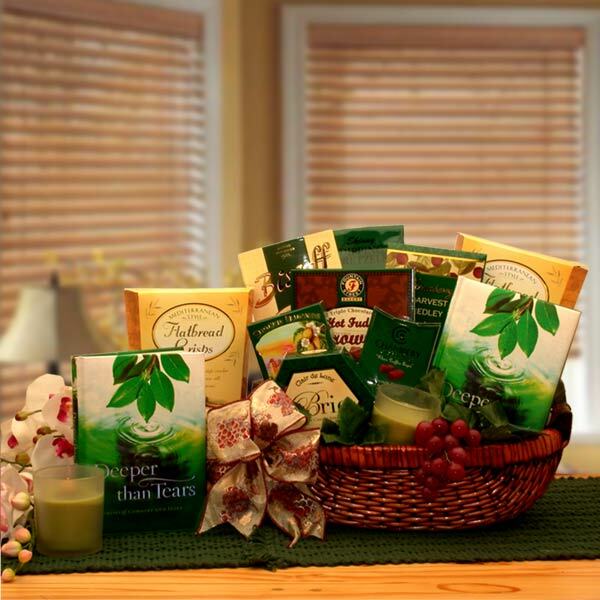 With Our Sincerest Sympathy Gift BasketSend your care and sympathies today with a beautiful gourmet gift basket. We've included a generous assortment of delicious gourmet foods for them and any guests they may have stop by in this time of sorrow.